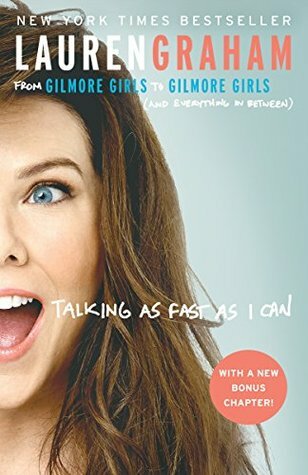 During my latest celebrity memoir kick, I blew through Lauren Graham’s Talking as Fast as I Can: From Gilmore Girls to Gilmore Girls. Graham begins at the start of her life and runs through the events of her childhood to her current life as, at the time of writing, she was in the process of finishing up the Netflix reboot of Gilmore Girls. A super-fast read at 224 pages, Graham’s memoir is fun and funny, much like readers might expect Graham to be. Despite, or maybe exactly like, the title depending on how you look at it, Graham’s focus on her work with Gilmore Girls is pretty minimal. Graham discusses how she came to be on the show and a bit of her experience with the first couple of seasons, but her willingness to go into detail falters. Even in writing about her work on the reboot, Gilmore Girls: A Year in the Life, Graham avoids a tell-all, which is disappointing, given the marketing and timing of the book, which arrived shortly after the series became available on Netflix and, to my mind, was advertised as something that might be read as a companion to the show with information for the fans. Interestingly, Graham provides quite a bit of characterization, relatively speaking, of Kelly Bishop who plays her mother in Gilmore Girls. Meanwhile, Alexis Bledel, who Graham mentions being quite close to throughout filming, makes few appearances and has little in the way of description from Graham. Other co-actors, such as Melissa McCarthy and Yanic Truesdale, like Bledel, are so absent from Graham’s memoir that it makes the reader wonder if their relationships with Graham are so unhappy that Graham avoided telling more to bow to professionalism. If that’s the case, it’s rightly so, but what little Graham does offer suggests perfectly happy working relationships. Where many other celebrity memoirs are willing to share detail on how actors work and play together, Graham is hesitant. And even further, Graham largely avoids talking about the greater atmosphere and the process of making either iteration of Gilmore Girls in favor of describing her personal routines. While these are interesting on their own, it feels like a short sale for folks who are interested in reading specifically about how she works within the context of Gilmore Girls and her own understanding of her character, Lorelai Gilmore, particularly given the book’s subtitle. Still, readers can enjoy Graham’s sense of humor. She never takes herself too seriously and frequently pokes fun at Hollywood culture and her peers. One particularly funny moment was a crack at celebrities who use ghostwriters, which she insists she has not done for this memoir, providing evidence via the novel she also wrote, Someday, Someday, Maybe — why, she asks, would she write a novel on her own and not this? In further detail about her writing process, Graham lets readers in on an immeasurably helpful tool: the kitchen timer method. Developed by a friend of a friend, the method is adapted from the Pomodoro Technique, which aids in productivity particularly in the craft of writing. Graham lays out all the rules of the method and encourages readers to try it — I tried it myself in a loose form and have already found quite a bit of success with it. Thanks, Lauren! Graham could use more detail in most of her anecdotes and writing as well as a bit more clarity — though she regularly refers to family members, her family tree isn’t quite fully explained anywhere, which makes some of her stories and the characters in her life unclear. Because of what information she did share, the particulars of these connections felt relevant, and I ended up seeking out her family tree on my own which helped fill in some gaps of understanding and made her narratives altogether more clear. Like many other celebrity memoirs, Talking as Fast as I Can is fast-paced and easy to read. Graham tells fun stories, but this is by no means an all-out reveal of her life, Gilmore Girls, or her co-stars. Still, Graham is intelligent and funny throughout, even managing to provide some excellent practical advice for readers looking for something a little more.